Teewinot weighed 32 pounds at birth (a bit more than necessary!) and has been growing well. Gwen has taken a shine to her ... Teewinot thinks Gwen is one of the "cool" ones, but isn't really into being tied to any human. Teewinot is (er, was) the upgrade to dam Greymist that we had long awaited. She inherited a strong four-beated walk and fine trot from both parents, and has been endowed with Rocky’s sensibility, mellow character, and heavier bone. The final kicker is … she is NOT a kicker, period. (Greymist has the most powerful reflexive kick you’d ever want to see, inherited from her sire.) Unfortunately, Teewinot has proven to be a curaca type rather than classic-coated, and must be shorn every other year. We’ve had several unrelated llamas with small umbilical hernias that developed a week or so after birth and then fully resolved on their own within the first few months or so. Much to our shock and dismay, Teewinot managed to develop a larger hernia. MUCH larger. Although we were initially doubtful that she could avoid surgery, the umbilical sphincter did indeed want to close, so Teewinot got to wear a hernia belt with a harness for awhile to give the natural closure process an assist and (most important) to prevent an intestinal strangulation. Teewinot’s unusually high activity level undoubtedly responsible for the extent of the protrusion. 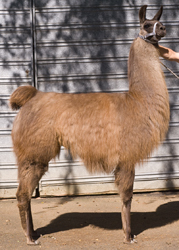 However, the presence of the large umbilical opening is considered to be heritable in llamas (no actual studies have been conducted, nor any DNA markers identified), and we have since learned of a paternal half-sib with an umbilical hernia requiring non-surgical treatment, and now Elahn, a nephew, has a slow-to-resolve umbilical hernia (that has not required any intervention). We are now proceeding under the assumption that the condition we are seeing here potentially has a hereditary component. Based on research into all the unrelated dams of these mildly affected offspring, we are also seeing a common thread of subclinical physical stress and inflammation around the time of birth. Ultimately we have to say we don't have definitive answers, and will not remove otherwise fine llamas from the gene pool on this basis alone, but also will make full disclosure for any affected or even distantly-related llamas we may sell. At this time, we have come around to the point that we may feel comfortable breeding Teewinot on a very limited basis for our own personal packing and driving replacements, but we will definitely keep Teewinot as a nonbreeding family member and working llama even if we never do actually choose to breed her — Teewinot is in the "not for sale" and "don't ask" categories. “Teewinot” (say: tee-win-oh) is the French adaptation of the Shoshone word for the Teton Range (it has since been applied to one specific peak in the range by whites).